A military court convicted 26 military officers with conspiring to overthrow the current regime in collaboration with two prominent Muslim Brotherhood leaders in August, according to a copy of the indictment obtained by Mada Masr. The defendants faced a number of major charges, including attempting a military coup, terrorism and joining the Muslim Brotherhood, as well as attempting to forcibly occupy public institutions. In the absence of any official or published information about the investigations, it is not possible to confirm or deny the accuracy of the charges leveled against the defendants. The confirmation or the denial of the charges is also made impossible given the refusal of lawyers to comment on the evidence presented by the military prosecution and Military Intelligence against their clients, in the hope that the sentences may later be reduced. Relatives of the defendants say that those who were tried in absentia received sentences of life imprisonment. Of those that were present in court, four defendants also received a life sentence, with 10 receiving 15 years imprisonment and the remaining seven sentenced to 10 years in prison. 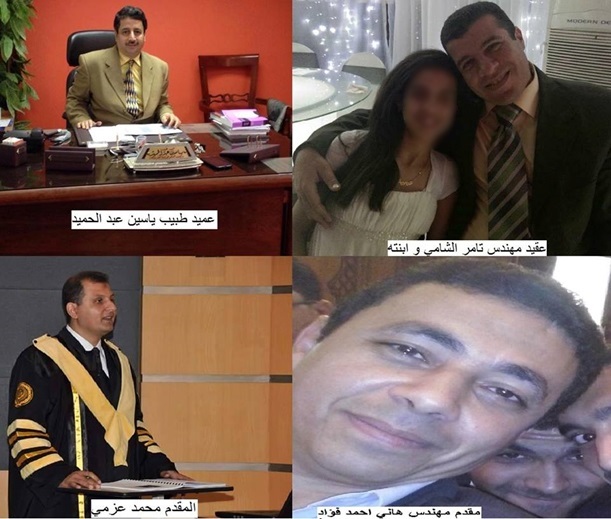 Mada Masr has conducted interviews with first and second-degree relatives of several defendants about the conditions in which their relatives were arrested and their treatment in detention (they spoke to Mada Masr on condition of anonymity and nondisclosure of the nature of their relation to the defendants). Together with the indictment sheet, Mada Masr has uncovered some of the case details, which have received no media attention, save for some Brotherhood-affiliated news outlets and a short BBC story citing “military sources” on August 16, 2015, the day the verdict was issued. The Armed Forces spokesperson could not be reached by for comment on the issue, despite repeated attempts. Neither the Ministry of Defense nor its Military Justice Authority has issued any statements regarding the case. Four of the accused officers. According to the indictment order in case number 3/2015 by the military public prosecutor, four of the defendants were retired officers who were sentenced in absentia, given that they fled the country. One of them was a colonel. The remaining 22 defendants included two retired army officers, one of them a brigadier general, and 20 who were still serving in the Armed Forces at the time of arrest, including a brigadier general and two colonels. One of the defendants was Major Momen Mohamed Saeed Abdel Aty, brother of General Ragai Saeed, former deputy commander of the Central Military Zone. Abdel Aty’s name first appeared in the summer of 2013, when he was in charge of securing the Mohandiseen neighborhood west of Cairo. He appeared in a YouTube video reprimanding the police for firing tear gas at a demonstration supporting ousted President Mohamed Morsi on August 30, 2013. Although sources told Mada Masr that Sad had retired a few weeks after officers accused in the case were arrested, Mada Masr could not independently confirm this information. In addition to the 26 officers, the indictment order included two civilians who received life sentences in absentia. The first was Helmy al-Sayed Abdel Aziz al-Gazzar, a physician and former MP for the Freedom and Justice Party, the Brotherhood’s political arm. Gazzar was also the party’s secretary in Giza. The second was Mohamed Abdel Rahman al-Morsi Ramadan, also a physician and a member of the Brotherhood’s Guidance Bureau. Ramadan was one of the Brotherhood’s prominent leaders in Daqahlia, a northern Delta governorate. Authorities arrested Gazzar two days after Morsi’s ouster in July 2013, accusing him of inciting violence in clashes between the deposed president’s supporters and residents of the Been al-Sarayat district in Giza. He remained in pre-trial detention for more than a year before he was released in August 2014 on LE100,000 bail pending trial in a case that has yet to be referred to court. Gazzar left the country following his release from jail. His family said that security authorities were aware that he had left Egypt for an unknown destination. According to Brotherhood sources, Ramadan went into hiding after the violent dispersal of the Rabea al-Adaweya sit-in in August 2013, which protested the removal of Morsi from power. Ramadan’s wife, Seham al-Gamal, former MP for the Freedom and Justice Party, died in October 2013 from injuries she sustained when she was shot in an attack on a pro-Morsi women’s march in Mansoura on July 20 of the same year. According to all the defendants’ families, all the officers were summoned or arrested in April 2015. Captain Ahmed Abdel Ghany Gabr held the lowest rank among the eight officers who received the harshest penalty of life imprisonment. Thirty-year-old Gabr is married and has two children, aged seven and three. 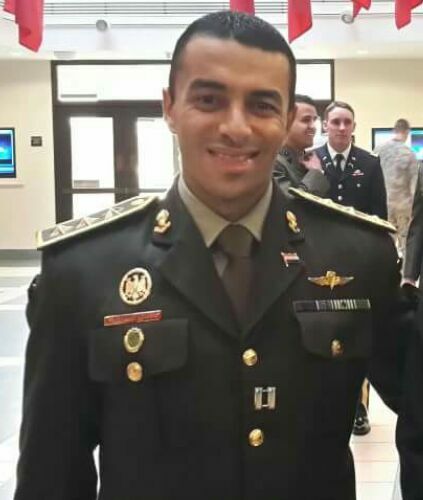 Sources say that Gabr was among the best of his peers during his years at the military academy and was an artillery officer at the time of the January 25, 2011 revolution. 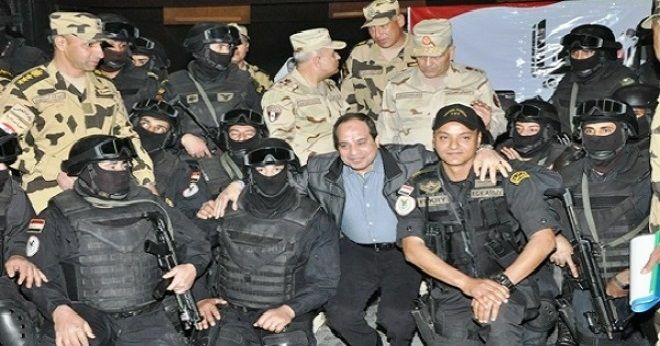 When former President Hosni Mubarak ordered a military mobilization to secure the country during the uprising, Gabr was serving in an area in Giza. One of his friends says that he saw Gabr exercise “heroic” efforts to defend police stations in 6th of October City, where they both lived. 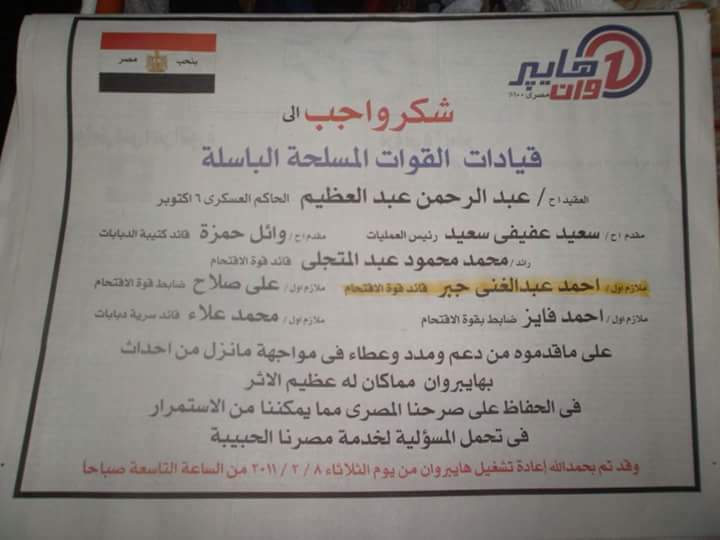 In February 2011, the hypermarket HyperOne in the area published a newspaper advertisement thanking a number of military officers for their efforts in securing the mall during the revolution. The note mentioned Gabr by name. 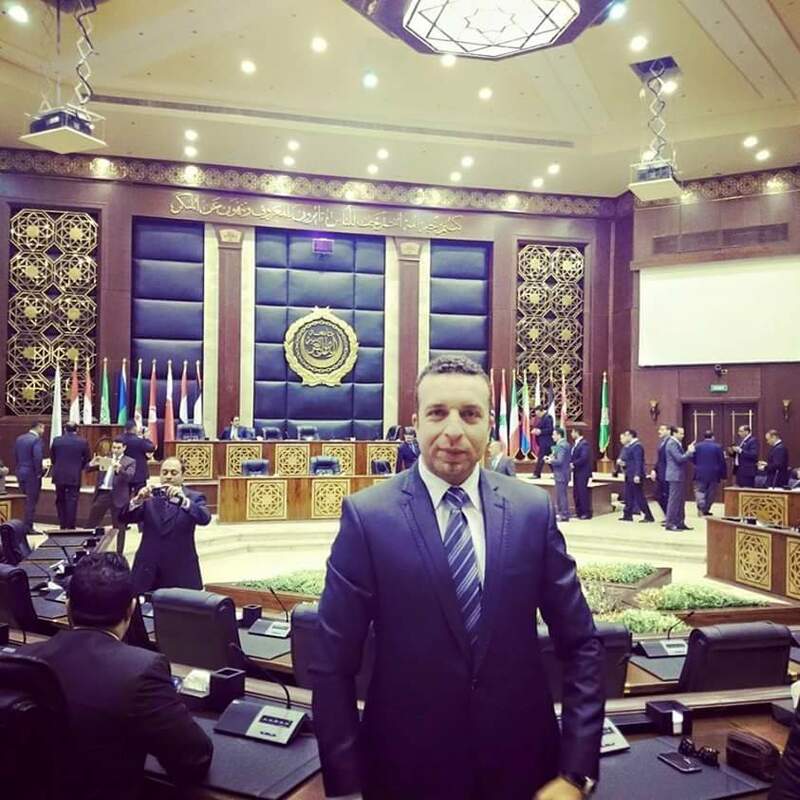 In March 2011, Gabr was one of the military officers who participated in securing the Interior Ministry’s State Security Investigation Services (SSIS) headquarters in 6th of October City, preventing SSIS officers from destroying documents and files. State Security head Hassan Abdel Rahman, along with 40 of his officers, were put on trial after Mubarak was ousted for destroying documents belonging to the authority. 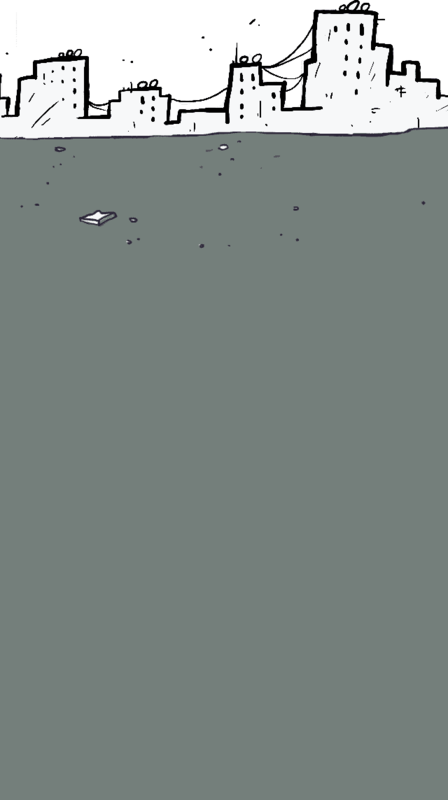 Gabr was summoned in the case as a witness. In June 2013, the court acquitted Abdel Rahman and all other defendants in the case. Gabr’s relative believes that he had been subject to retaliation because of his role in confronting State Security after the 2011 revolution. “When his name became known during the January 25 revolution, they decided to move him from the artillery to the military police. Later they asked him to join the department of Military Investigations. In all courses he took, he was the most successful. He was then nominated to join the personal guard of Abdel Fattah al-Sisi, who was then minister of defense. All these movements within the military took place after a security clearance,” the relative says. The relative adds that the National Security Agency (which replaced State Security Investigation Services in March 2011) decided to remove Gabr from Sisi’s guard force in 2013 for security reasons. However, in light of his experience, he was not returned to the artillery but was transferred instead to military police, where he worked at the headquarters of the military prosecution in Nasr City, east of Cairo. In June 2014, Gabr’s request to travel to the United States for training within the framework of the US military aid program was approved. After receiving security clearance, he left for Missouri and returned five months later in November 2014. Before and after his travel, according to his relative, the Armed Forces commissioned Gabr to train foreign military delegations, including Afghan and African troops, in counter-terrorism (his field of specialization), guarding important personalities and special operations. On April 23, Gabr called his family and told them that he had been summoned to the artillery department. Twenty minutes later, he called his family again, saying, “I’m going off on a mission and I’ll be gone for a bit longer. A day, maybe two, maybe a week, I’m not sure. I won’t be able to say more. Goodbye.” After that, he became unreachable by phone, according to his family. A few days later, the family began to worry and attempted to call the artillery department and the military police several times, but failed to get any information. The family also noticed that Gabr’s colleagues were no longer taking their calls. Only one of Gabr’s colleagues visited the family and told them he thought their son was being held in the Military Intelligence headquarters. That colleague was arrested later and put on trial with Gabr in the same case. The relative says that Military Intelligence held Gabr for 23 days, during which he called his family twice to tell them that he was fine and that the matter would end in a few days. The third time he called, he said that he had been charged in a major case with attempting to overthrow the regime and requested a specific lawyer. After that, Gabr and the other defendants were transferred to military prison in the Hikestep, a military base on the Cairo-Ismailia Desert Road. When relatives of the defendants attended the first court session in May in the Hikstep military court, they saw their family members for the first time since their arrest, sitting in court cages. At the time, Gabr and his co-defendants told their relatives that they had been subject to severe torture, and that they should not believe their “confessions” because they were taken under duress and while they were blindfolded. When the judge entered the courtroom, he demanded that all relatives leave the room, keeping only the defendants and their lawyers. Defense attorneys later confirmed to family members that the defendants informed the court that they were tortured and plead for their confessions to be dismissed since they were obtained through coercion. When families were allowed to visit the defendants in prison after the start of the trial, additional information on the case gradually surfaced. Gabr told his family and his lawyer that the defendants were tortured before they were transferred to military prison. He claimed that he was tortured the most because his captors informed him that they had evidence he had received special training in his military formation and in the US on enduring torture and passing lie-detector tests. He was also told that he was the most dangerous among the group, since he had worked as a personal guard for the president and was in his vicinity for a substantial period of time. Later, the military prosecution interrogated the defendants while they were detained at the Military Intelligence headquarters. “They threatened them, saying that anybody who said anything in front of the prosecution other than the confessions they signed would be harmed. However, Ahmed [Gabr], blindfolded in front of the prosecution, denied all his confessions and said they were taken under duress. After the prosecution left, he was beaten and tortured again,” the relative says. Major Mohamed al-Ruby, who was sentenced to 10 years in prison, belongs to a family of police and military officers and judges. 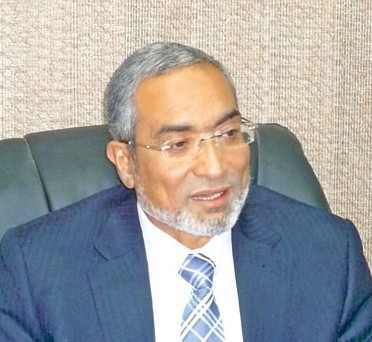 According to one of his relatives, Mohamed’s paternal uncle is Judge Abdel Moneim al-Ruby, former vice chairperson of the administrative prosecution authority. His father’s cousin was appointed in 2011 as the governor of Minya in Upper Egypt. The relative adds that Mohamed was among the officers responsible for the security of the Egypt Economic Development Conference in Sharm el-Sheikh in March, a few days before he was arrested. “Last message I received from him over the phone was on April 27. Whenever we met over the weekend, Thursday and Friday, when we returned home in the Ayat neighborhood in Giza he would tell me, let’s not talk about politics. Before that he also told me not to post comments on his Facebook page,” the relative says. The relative also says that Ruby’s wife had donned a niqab for a while before his arrest, after which he was summoned by Military Intelligence and questioned on the issue. Ruby allegedly replied that this was her personal choice. His wife took off the face veil a month later when she realized that she had caused him trouble. He was then summoned again and asked why she had removed it. “He said she put it on when she wanted and took it off when she wanted,” the relative explains. Like the other defendants, Ruby told his family and lawyer that he and the other defendants were tortured during the first phase of their detention in Military Intelligence headquarters, but that their treatment improved relatively after their transfer to military prison, where they were provided with food and water and were allowed to sleep. Like Ruby, several of the convicted officers came from the suburbs and villages of southern Giza. Among them was Major Mohamed Hamed Mohamed Hamza, one of the eight officers sentenced to life in prison. His relative thinks he was harshly sentenced because he had the personality of a leader, to the extent that the only prosecution witness in the case, a Military Intelligence officer, wrote in his reports and later testified in court that Hamza used to gather the rest of the defendants in football competitions, and that they used to play in two teams: Iman (faith) and Hamza. Hamza told his family that one of his co-defendants continued to suffer from a back injury as a result of torture and that another defendant had sustained partial hearing loss in one ear after being beaten. What ties with the Brotherhood? The relatives who agreed to speak to Mada Masr deny the charges made against the defendants, as well as any relationship to the Brotherhood. However, they all confirm that the defendants were religious and conservative, and that some of their behavior might have attracted attention, such as regularly reading the Quran or leading prayers among their colleagues. Meanwhile, a former member of the Brotherhood asserts that Gazzar was known in the group for his enthusiasm for forming secret groups of Brotherhood sympathizers and supporters that included football players, artists and, perhaps, military personnel. Sources drew attention to the fact that Gazzar and Guidance Bureau member Abdel Rahman were both physicians. Since the first and most senior defendant in the case, Brigadier General Yassin Abdel Hamid Mohamed, was also a military physician, there is a possibility that the two leaders had contacted him, and he in turn communicated with other military officers. Mohamed was one of the eight officers sentenced to life imprisonment. “Everybody was talking freely after January 25 and until 2013,” was a statement made by all relatives in separate interviews, indicating that the defendants began to openly talk about politics for the first time after 2011. This may have attracted attention to them and led to their surveillance, ultimately resulting in their arrest, the relatives explain. The penalty for both crimes is life imprisonment. The military prosecutor accused the seventh defendant, Major Mostafa Mohamed Mostafa, of violating Article 80b of the Penal Code, which punishes “any public servant who discloses any of the state’s defense secrets,” after he allegedly provided the 28th defendant, the Brotherhood’s Gazzar, with “information about the Armed Forces and their formations, including information on trainings, armament, technical qualifications of vehicles and armor, as well as relations between commanders,” along with other sensitive information. As noted above, it is not possible to confirm the validity of these charges. Relatives obtained a list of the verdicts in the case. They say that the military court sentenced all of the defendants in absentia to life imprisonment. Another four defendants who attended the court proceedings were also sentenced to life in prison, including Brigadier General Yassin Abdel Hamid Mohamed and retired Brigadier General Osama Sayed Ahmed Ali (the highest ranks among the defendants), retired Major Ahmed Mohamed Abdel Tawab, Major Mohamed Hamed Mohamed Mohamed Hamza and Captain Ahmed Abdel Ghany Gabr. Ten defendants were sentenced to 15 years in prison, including Colonels Tamer Ibrahim Abdel Fattah al-Shamim and Abdel Hamid Mohamed Mohamed Abdel Hamid, Lieutenants Loai Imam Mohamed and Mohamed Hassan Abdel Latif Azmy, and Majors Nabil Omar Ibrahim, Mostafa Mohamed Sayed Mostafa, Tamer Khalifa Ragab Khalifa, Mohamed Abdel Aziz Sayed, Amgad Samir Saeed Abdel Momen and Khaled Ali Mostafa. Seven defendants were sentenced to 10 years: Lieutenant Hany Ahmed Fouad Saad Eddin, Major Mohamed Abdel Raouf Mahmoud al-Ruby, Major Mohamed Selim Ali Ibrahim, Major Momen Mohamed Saeed Abdel Aty, Major Abdel Qader Abdel Fattah al-Sadeq, Major Mahmoud Shawky Mohamed Abdel Rahman and Major Ahmed Mohamed Ali al-Rashidy. Relatives say that the reasoning of the verdict issued on August 16 has been written but the sentence has not yet been ratified. Military law stipulates that sentences are not considered final before their ratification by the minister of defense or his representative, who has the authority to uphold, reduce or overturn the sentence and order a retrial. The families gathered and went to the Ministry of Defense to seek amnesty for their relatives in September. Two weeks ago, they went to the Ettehadiya Presidential Palace and requested that the verdicts be reconsidered. Even if the conviction is ratified, families remain hopeful about their final appeal before the military Court of Cassation. Who let the jihadis out?